$35 for a Swarovski Crystal and Application. Patient may choose additional jewels at the cost of $10 EACH (must be applied in the same appointment). Removal of the jewel is free of charge at anytime, as long as our office placed the jewel. Our office offers a 30 day guarantee that if the jewel falls off in the first 30 days, we will replace at no charge. No pain and no numbing! The procedure is similar to placing an orthodontic bracket (braces) on a tooth. There is no drilling involved and the procedure is completely painless. The application procedure should take no more than 5 to 10 minutes. 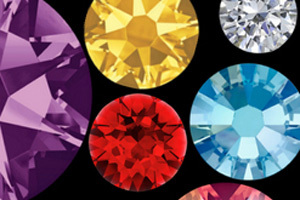 Swarovski Crystals are small in diameter. They range in size from 1.8mm, 2.15mm, and 2.65 mm. Initially something on your tooth will feel different, but a few days after the application you will get used to the new feeling. Is the tooth jewelry for males or females? Both! There are many different designs which appeal to everyone. Children under the age of 16 should have parental consent. How long will the jewelry stay on my tooth? A tooth jewel applied according to our office on a natural tooth should stay on until you decide to have it removed by your dental professional. This does depend on your oral care at home. How do I remove the tooth jewelry when I no longer want it? Our tooth jewelry is 100% reversible. 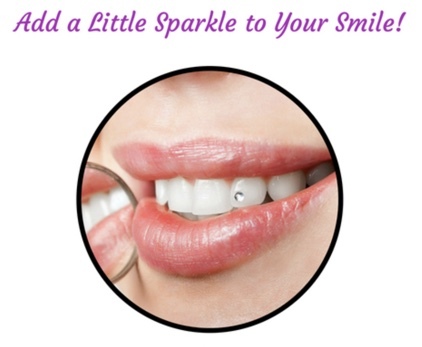 If you would like to remove your tooth jewelry it can be taken off by your dental professional at any time. The tooth will be polished to remove any remaining bonding material. When properly placed on a natural tooth, the tooth jewelry will not damage or harm your tooth in any way. This does depend of your oral care at home. $50 for the jewel and application, any additional jewels during same appointment are an additional $10.00 each. Removal of jewel is at no charge to patient who had jewel placed in our office. 30 day guarantee: If jewel falls off in first 30 days from application we will replace for free, up to 1 replacement jewel.